Posted 5:12 pm by Pine Tree Mall & filed under Mall Construction. 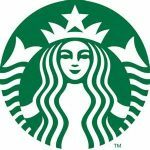 Help us welcome Starbucks to Pine Tree Mall when they open January 10th, 2019. Posted 11:19 pm by Pine Tree Mall & filed under News. 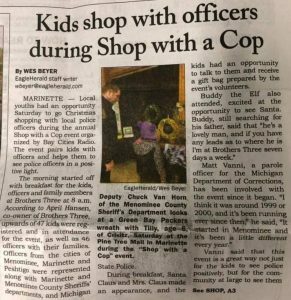 A great turn out for the Shop-with-a-cop program! Thank you to all the officers , volunteers and to Bay Area Radio for all the hard work! It was a big success! Posted 1:49 pm by Pine Tree Mall & filed under News. On May 17th, Marinette Menominee Area Chamber of Commerce presented Pine Tree Mall with a “Parade of Progress” Award for having made a significant investment in its business in 2017. The renovation at the Mall was applauded for its contribution to the economic development in the Marinette Menominee Area. Posted 1:52 pm by Pine Tree Mall & filed under News. 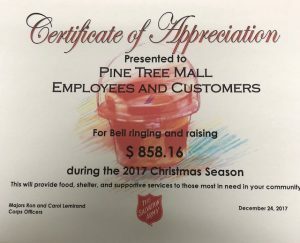 The Salvation Army would like to thank the Pine Tree Mall employees and customers for their generous contributions during the 2017 Christmas Season. Posted 10:26 pm by Pine Tree Mall & filed under News. 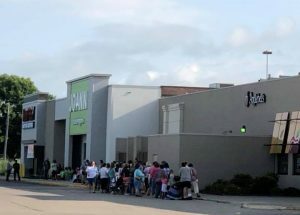 JOANN Fabric and Craft Store is coming to Pinetree Mall. Construction has begun. Posted 10:21 pm by Pine Tree Mall & filed under News. The 2017 December Holiday Craft Show was a great success with over 50 vendors and crafters filling the walkways and displaying their goods and services. Check out some of the action below. Posted 4:39 pm by Pine Tree Mall & filed under News. The Salvation Army will distribute collected coats to children at the mall on November 11th. They will also be giving away a free book to each child. Posted 4:35 pm by Pine Tree Mall & filed under News. Double R Cedar Works will be open in the mall for the holiday season. Stop by their booth to learn more about them. 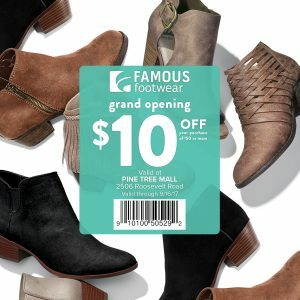 This Saturday: 100 guests get free shoes store open to 5pm + $10 off $50! Exclusions apply. Screenshot to use in-store. Posted 5:29 pm by Pine Tree Mall & filed under News.